The lambs of New Zealand are here to protect your feet. 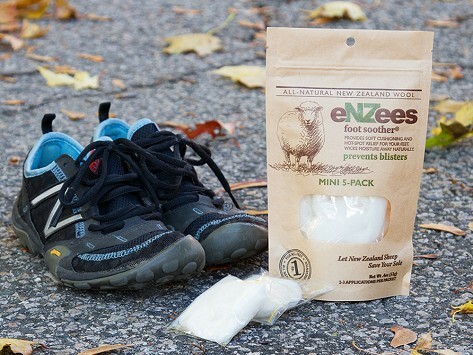 This eNZees is 100% natural lambswool that prevents blisters and hot spots with lanolin—the wax that keeps lambs’ coats dry. It wicks away moisture and reduces the friction that causes your shoes to turn against you. Keep a mini-packet in your purse or pack one when you go camping. Tear off a piece, hold on your trouble spot, then slip on your shoes or socks. Dimensions: Each wool packet: 3" x 3"
Use this all the time, truly holds in place and doesn’t rub/irritate, much better than moleskin! Very happy with the relief I have received. eNZees REALLY works---soft, soothing, blister free toes!! !